When pre-drilling for screws, how do you determine the correct bit diameter? Suppose I want to pre-drill for, say, a 5/16 screw. How do I determine the correct drill bit diameter? Here are some charts from Bolt Depot. Bolt Depot is a handy resource, and has lots of information about all different types of fasteners. A real simple technique I use is to hold up the drill bit and the screw. Hold the shaft of the drill bit up in front of the screw. You should only be able to see the threads of the screw (and maybe a bit of the screw). If you can't see the threads the drill bit is too big. If you can see too much of the screw, the bit is too small. It depends on if you want it to be loose or not. If you want it to be very loose (in the case of a bolt where you're going to have washers on both sides and a nut on the far side threads, then feel free to upsize by a fraction -- in this case, 6/16 or 3/8. If you're using a screw where you want the threads to be firmly bedded, use the smallest drill bit you have in a soft material like wood -- and in harder substances like metal or concrete, a drill bit that is one fraction lower (e.g. 4/16" or 1/4" in this case). 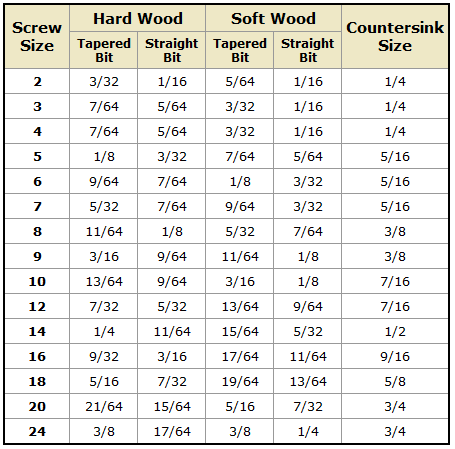 The best charts I have found for both tapered and straight wood screws is at http://www.wlfuller.com/html/wood_screw_chart.html - the fuller company has been around forever and it shows with the customer service and the accuracy of the advice. Not the answer you're looking for? Browse other questions tagged wood tools drill or ask your own question. How do I hang curtain rods? 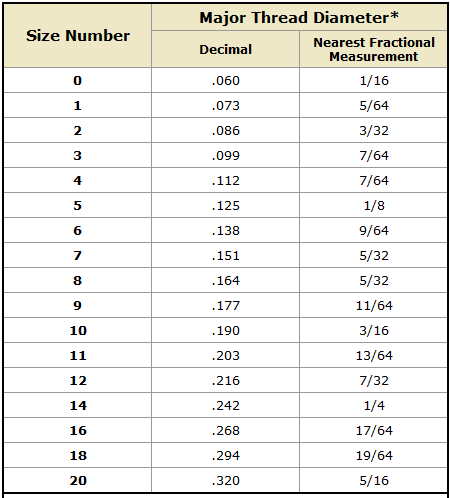 What is the correct method to determine the drill bit size from the measured threaded diameter? Do I have the right tools for drilling granite? Is it possible to reduce the diameter of a drill bit? What is the name of the tool used to create an initial dent for drilling? How to choose correct drill bit size for screw and wallplug? How do I remove the drill bit from my hammer drill? When drilling metal, should I start with a smaller bit before using a larger bit?